Imagine the scene -- you walk into a church, expecting simple pews and a cross at the altar. Instead, you're faced with a fight ring surrounded by bleachers filled with families. Two men lumber down to the ring -- their biceps are splattered with tattoos of crosses and windy Bible verses. Welcome to Fight Church, where you "can love your neighbor as yourself and then at the same time knee him in the face as hard as you can." 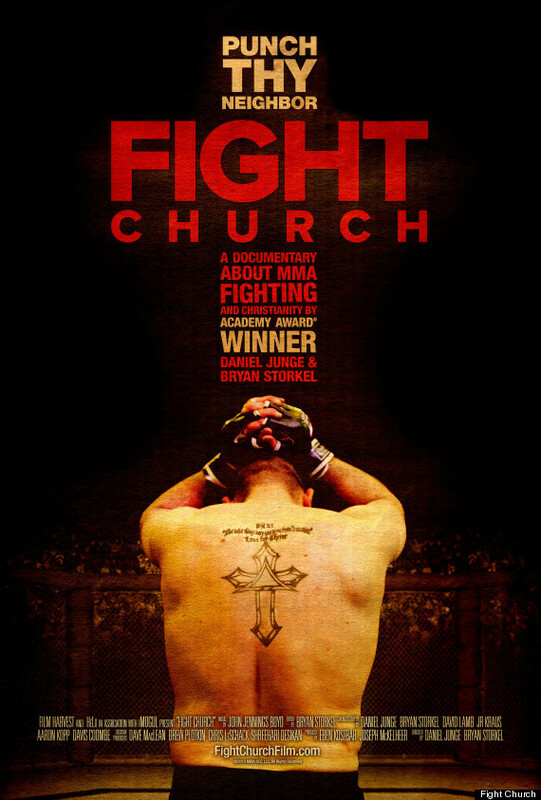 This new documentary (premiering in Boston on April 24th) explores various churches that add Mixed Martial Arts to their activities bulletin, alongside yoga classes and Bible study. In the trailer, one pastor explains his feelings about the feminization of Mainstream Christianity. While Jesus never endorsed violence, Biblical legends like David and Samson were renown for their physical strength. MMA attracts the stereotypical "tough guy" to a church where he might not feel as welcome when services include feel-good messages and soft guitar music. The directors intend for the film to generate conversation about the connection between fighting and faith - another example of post-modern Christianity in our society. We would break bricks and bend nails and we'd play a game called 'Kill the Preacher' where we'd let someone put a knife to our throat and we'd take it out of their hands and stuff like that. It sounds silly, but Burress said it was a great way to attract people to church who wouldn't go otherwise. Winners at the matches first thank God when they are finished fighting and feel more comfortable at church knowing they can be the same person in and out of the sanctuary. I don't think you should be 'this is my Sunday me, and this is my Monday-Friday me'. Like God made you... for a reason. If he made you a computer guy, you be the best computer guy for God and use it for him… He made me a fighter so I'll fight for him. Is this new type of Fight Church a holy outreach or wholly illogical?